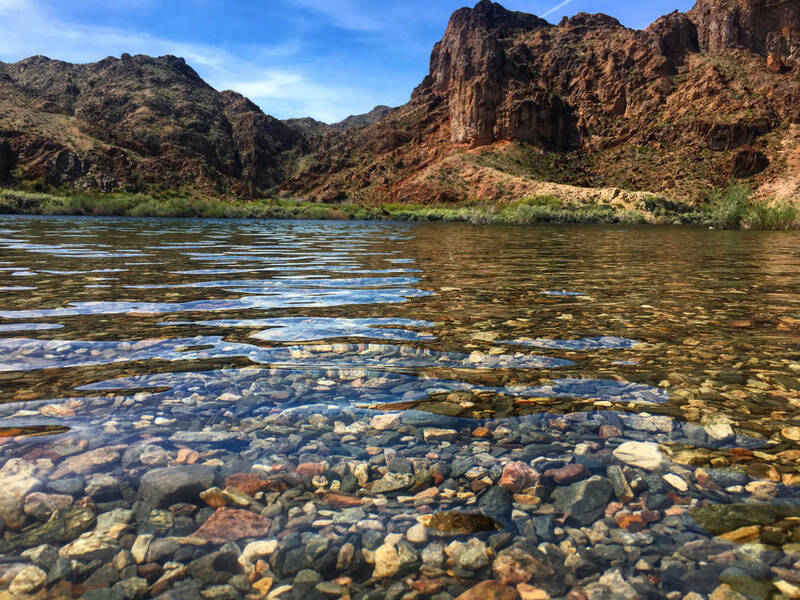 Janna Karel Las Vegas Review-Journal The lower Colorado River, seen near Willow Beach, Arizona, was named a conservation group's most-threatened river in America. 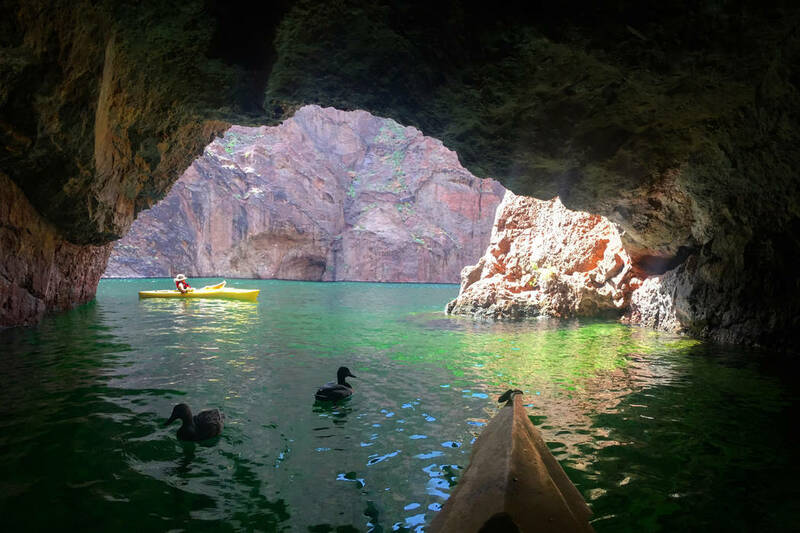 Janna Karel Las Vegas Review-Journal Emerald Cove on the Colorado River is about a mile up river from Willow Beach, Arizona. The cove is part of the lower Colorado, which was named the most-threatened river in America by a conservation advocacy group. The nonprofit American Rivers had placed the entire Colorado River and upper river atop its list of “most-endangered rivers” in previous years. But this is the first time the lower Colorado, which supplies Las Vegas with 90 percent of its water via Lake Mead, has been designated as in danger. “The main criteria we use is whether there’s a key decision point in the year,” said Amy Kober, a spokeswoman for the group. In the case of the lower Colorado, much of the impact could come from President Donald Trump’s proposed budget, which would cut funds to the Department of Agriculture’s regional conservation partnership program and the Department of the Interior’s Water- Smart program, she said. Trump also has issued an executive order that would eliminate a 2015 water rule issued by the U.S. Environmental Protection Agency, which asserted federal power over small waterways like wetlands and streams for the purposes of controlling pollution under the Clean Water Act. The order had no immediate impact but could eventually lead to the rule’s repeal. The lower Colorado, which provides drinking water for 30 million Americans, including residents of Los Angeles, San Diego, Las Vegas and Phoenix, and irrigates fields that grow 90 percent of the nation’s winter vegetables, is particularly vulnerable to such actions, the group said. The water demands of Arizona, Nevada and California are outstripping supply, climate change’s effects are becoming acute, and the river is at a breaking point, it said. But Patricia Mulroy, who has worked within the international water community for 25 years, expressed frustration that the river is being used as a “political arrow” to score public relations points. Mulroy was referring to a 2012 agreement on the Colorado River between the U.S. and Mexico set to expire at year’s end and continuing negotiations on a drought contingency plan among Nevada, California and Arizona to keep Lake Mead from shrinking enough to trigger the first federal shortage declaration. That would force Nevada, which receives most of its water from the Colorado, and especially Arizona to slash use of river water. “Those agreements have to be entered into,” Mulroy said. Despite the political rhetoric, Bronson Mack, a Southern Nevada Water Authority spokesman, said the agency expects the agreements will get done. “Water cuts across party lines,” Mack said. Even if water levels do reach shortage territory, Mack said, Nevada residents won’t go without water. “Should Lake Mead get to that severe of an elevation, Nevada has taken steps to ensure that we would be able to access that supply,” he said. American Rivers is a nonprofit organization aimed at river conservation efforts. Located in Washington, D.C., the group has compiled a list of the nation’s “most-endangered rivers” since 2003. While the Colorado River has made the list before, this is the first year the lower Colorado has been named.